Earlier in 2019, we spoke to Alison Adams who is the Assistant Manager of The Black Rose Tavern in Edinburgh. Following on from their recent success at Scotland’s Best Bar None Awards, we had a catch up and Q&A session. You can read the original article here. 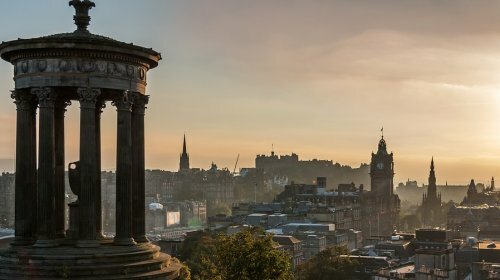 Edinburgh is a beautiful historic city that demands a visit if you haven’t already! Hello Alison, thank you for taking the time to answer these questions. It’s very much appreciated! Q 1. Well done on your latest awards, how did that come about? We have been involved with Best Bar None for a few years now. Our local licencing officer brought it to our attention, and we felt as it is industry based and judged on different criteria it was an award worth winning. We had previously entered other competitions ie: Newspaper pub of the year type events but felt these were more popularity and ‘who can sell the most papers’ than businesses striving to be responsible and maintain good practices. We are proud to say we have progressed from winning Gold in our first year as a new comer in the Edinburgh division, to winning overall best Bar in Edinburgh last year and this. Followed by Best Establishment in Scotland this year. Q 2. That’s fantastic, could you please tell us a little bit about Best Bar None and the Platinum award? As previously stated the Best Bar None awards is an industry award system. An independent assessor visits the pub and paperwork is checked. This can range from policies and risk assessments to promotions and staff training. From this visit you may get through to the local awards. Once through this stage there are further requirements including providing evidence of any campaigns you may be involved with, charitable events you may have run etc. Anything in fact that you may feel sets you apart. There will be mystery shoppers during this time done all manner of checks, staff presentation, age verification customer service etc. Last year we won the overall best bar in Edinburgh but had limited success at the nationals which we were very disappointed about. We were determined to win platinum this year and to our delight we did. Over and above that though we won the Best Establishment in Scotland. 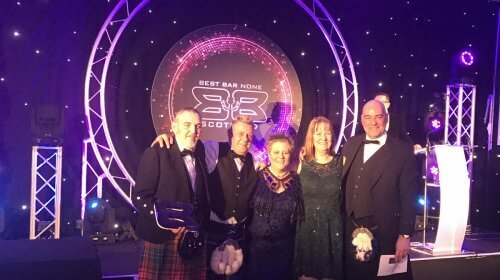 The Team from the Black Rose Tavern at Scotland’s Best Bar None Awards, courtesy of BBN. Q 3. Have you ever won anything like the Best Bar None award this before or is this award particularly special? This years’ achievement has made us especially proud, as the standard of entries was extremely high. We were nominated in 3 categories, won 2 out of the 3. Then won the platinum and took out the Overall Award. We are only a small pub but have an amazing team who make us proud. There is a lot of work involved with these awards but the sense of pride the staff feel inspires them to maintain high standards so well worth the effort. Q 4. We did a Q&A with you earlier this year and it’s one of our most read articles. Would you say it’s been beneficial and had a good response? We have had an amazing response to the Ask for Angela campaign. Our local police and licensing officers have given us amazing support and assisted us with getting venues on board locally. Thanks also to yourselves, SLTN and Heart radio the message has become more widespread which is fantastic. 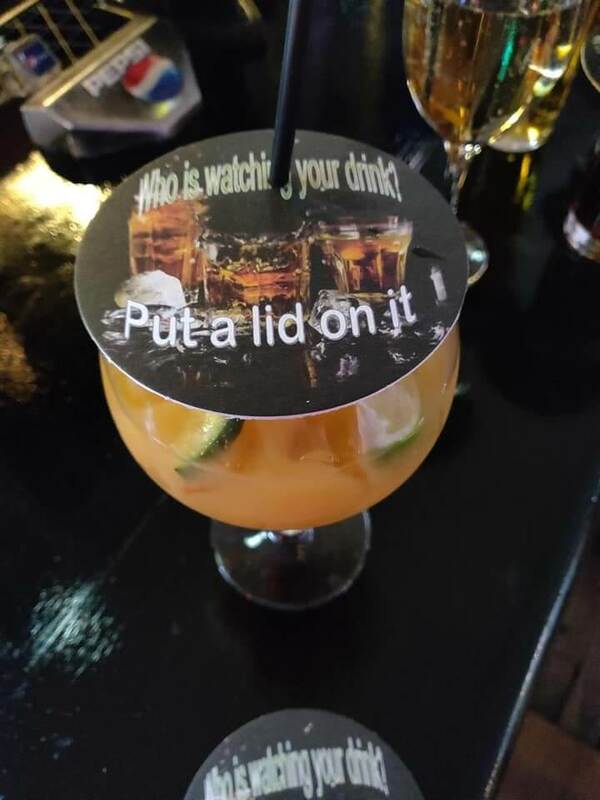 The Black Rose Tavern have introduced their own ‘Put a Lid on It’ Campaign. Q 5. How’s the ‘Put a Lid on It’ campaign going? The put a lid on it campaign is going fantastically well. We have attended pub watch meetings and the idea has been well received, it is such a simple thing yet could protect so many people. We have support yet again from local authorities, as well as Street Assist Edinburgh and The Alcohol Industry Partnership for Scotland are printing beer mats for us which is amazing support. Q 6. Have you got anything in the diary that we should know about? Any bands or gigs that are too good to miss? Every night there is live music in the Black Rose. We have recently re-introduced open Mic nights on Tuesdays where everyone is welcome to come along and participate. Instruments are provided. On top of that we have Karaoke on Wednesdays and a variety of live musicians every other night. 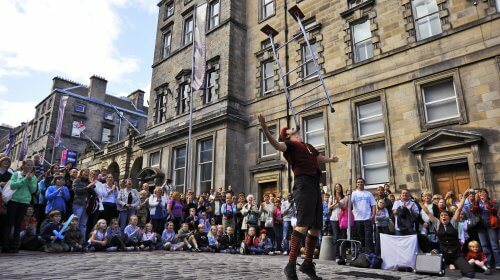 Every August sees the Edinburgh Festival take over the city with acts from across the world performing dance, theatre and comedy. Photo by Festival Fringe Society. Q 7. Sounds brilliant, it’s great to know that you have so much on. Is it too early to ask about the Fringe? Do you do anything special for it or host more bands or events? The fringe is a busy time for us, we are looking forward this year to having guest artists including ‘Brothers from other Mothers’ an Australian band who played and were very well received at last years’ festival. Q 8. Finally, the last time we spoke, you told us about sharing the bar with the ghost of an old man. Has there been any recent spooky goings on or anything strange to report? Things have been quiet on that front and other than the lights flickering in the office in the mornings (the only time it happens) there is nothing to report. I’m sure he would approve though, maybe that’s why he’s been quiet! Thanks again for speaking with us Alison, and Congratulations to yourself and the whole team at The Black Rose Tavern for winning the BBN Best Establishment in Scotland and the Platinum Award.